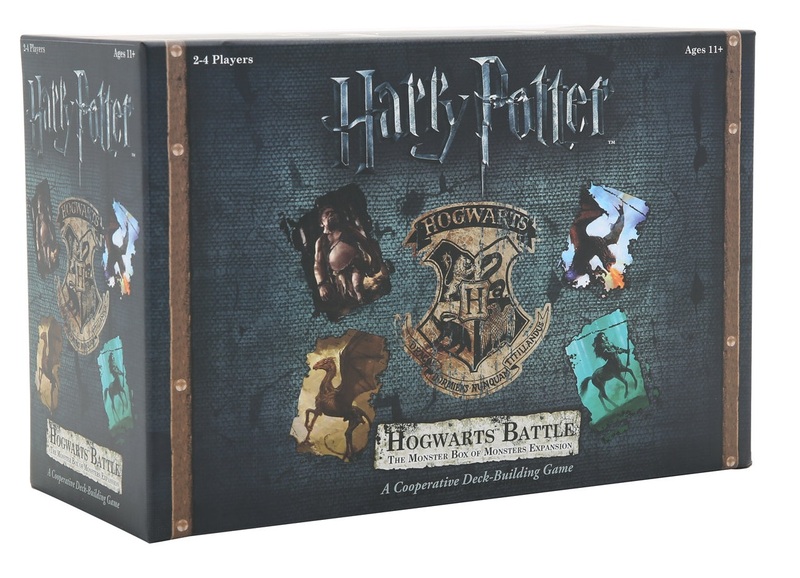 Harry Potter: Hogwarts Battle – The Monster Box of Monsters Expansion is an expansion for Harry Potter: Hogwarts Battle, published by USAopoly. It is for 2-4 players. This expansion adds 4 new boxes of content to expand the game with, including a new playable character, Luna Lovegood. For more information on Harry Potter: Hogwarts Battle and how to play the game, please follow the link below. So what all does this expansion add to the game? Well without spoiling anything, there are 4 new boxes worth of content. These include new Locations, Dark Arts, Hogwarts and Hero cards. There are also new additions in the Encounters, Detention and Creatures and Villain Creature cards. As I mentioned above, there’s also a new playable character, Luna Lovegood. She comes with her own starting hero deck of cards. Of course it’s suggested that before using any of the contents of this expansion, it’s best to have finished Game 7 of the original game. Now let me explain how setup works with these new additions. To begin with, box 1 should be opened up and all the contents separated. 12 influence tokens and 1 harp token should be kept near the board. The locations found in box 1 should be stacked face up in order. The new Dark Arts cards should be shuffled together with the original Dark Arts cards. The Encounters are are stacked in order face up in the center of board. The Creatures and Villain Creatures are shuffled together with 5 random Villain cards from the original set. The Game 5 Lord Voldemort card is placed face up on the bottom of the stack. The top 3 cards are then placed face up below on the board. The Hogwarts cards from the expansion are shuffled together with the original Hogwarts cards. The Detention cards are placed in a separate stack near the board. Players choose a Hero card and take the corresponding Hero card and 1 Game 6 Proficiency card. These are placed above the player board. The rest of the setup remains the same. The game plays much like it did with the original game, except with a few minor changes. Each player’s turn consists of 4 steps. First they will reveal and resolve Dark Arts events and the Encounter. The Dark Arts event is resolved first, followed by the Encounter. Each Encounter has an effect that normally triggers when certain conditions are met. Next the player resolves the villains and creature abilities by following each card’s text. In some cases, there will be certain Encounters that will be triggered during this step. Next the player will play Hogwarts cards and take Hero actions. Like with most deck builders, the player will play the cards from their hand to gain resources and generate effects. Some cards will allow a player to banish a card. This is a new effect that allows the player to remove a card from their deck for the rest of the game, placing it in the discard pile. Banished Detention cards are returned to the Detention stack. Once resources have been gained, they may be used to attack villains with and buy Hogwarts cards with. It should be noted that some creature cards require Influence to defeat them. This is a new mechanic that is introduced in this expansion. However unlike attack tokens, only one Influence token may be placed on a Creature each turn. Finally, the player ends their turn. In some cases, Encounters will trigger certain effects during this final step. Before any of the cards may be replaced at the end of the turn, the player should check to see if the Encounter has been completed. If so, then the player claims the card and may use the reward on a later turn. Play then passes to the next player. The game continues until one of two things happen. If the players have completed all the Encounters and all the creatures and villains have been defeated, then the players win. They are then able to move on to the next box. If the villains and creatures control all the locations, then the players lose and must reset the game and try again. It should be noted that there are more surprises inside the remaining 3 boxes, but I won’t go into that. I’ll leave that for you to discover and be surprised with. Just know that there are several new card types that will be introduced as well as some new tokens and a few other items of interest. As with the original game, this expansion brings a lot of new stuff that looks absolutely amazing. The quality is again, top notch. This expansion adds 4 new boxes worth of cards, tokens and other items that are very interesting. All of the cards have that same photo quality that was used in the original game. All of the cardboard tokens are very thick and sturdy and look very cool. I really like there are new character cards to be used with this game including the new playable character, Luna Lovegood. Speaking of which, if she’s used as a player character, her ally card is removed from the Hogwarts deck. Back to the components, so not only does the expansion have new material, there’s also some sorting cards that work with the original 7 games boxes in the first game. These make it possible to store all of the components of both this expansion and the base game together in the main box. Basically all the items are placed in the area that the original 7 game boxes were. Needless to say, with all the great pieces and components included with this, fans of Harry Potter will love the look and designs of this expansion. Each card, token and item is very thematic and fits in great with the overall look of the game. I’m very impressed with everything here. Overall, this looks fantastic. Much like the original rulebook, this rulebook evolves as you play the game. The back cover of the book is a bit thicker and has specialized slots for the smaller rulebooks that come in the boxes 2 through 4. These little rulebooks are small folded up sheets that show you which components to use and explain the new cards, tokens or other items that are introduced upon opening the box. Every set of rules from the main book to the smaller rulebooks has some great pictures and examples that show how the game is played. I really liked this design with the original game and love that it was carried over into the expansion as well. It definitely keeps certain things hidden until you need it. Overall, I like the look and feel of everything here and think that this just adds to the joy of the game. Let me say first off, this expansion is hard. I mean very hard. If you thought that the original game was easy, then you’ll be excited for the challenge of this one. For those of us that may have struggled a bit with the original, then you’ll really have some moments of frustration with this one. That’s not to say that the expansion is bad. It’s not! In fact, I love the challenge that the expansion provides. You just need to be aware that you’ll most likely not win every time. I’ve played several times and lost several times too. I like how the new cards work with the game. It definitely adds several new dimensions to the game. I like that the expansion has ways of playing the game, even after the last box has been opened and defeated. There are new difficulties including creating an epic level game. I haven’t tried this yet, but look forward to the challenge. I will say that the difficulty of this expansion may not be for everyone, especially the kids. That is, unless they don’t mind losing often. For me, this expansion is more of a gamer’s expansion and less of an add on to a great co-op family game. Families up to the challenge or those that absolutely love the world of Harry Potter should really enjoy this expansion. For those folks, this is a must have expansion. For everyone else, the difficulty may be a bit too much. Still this is a great expansion and one that I adore. I highly recommend this expansion. It’s well worth the price of admission. 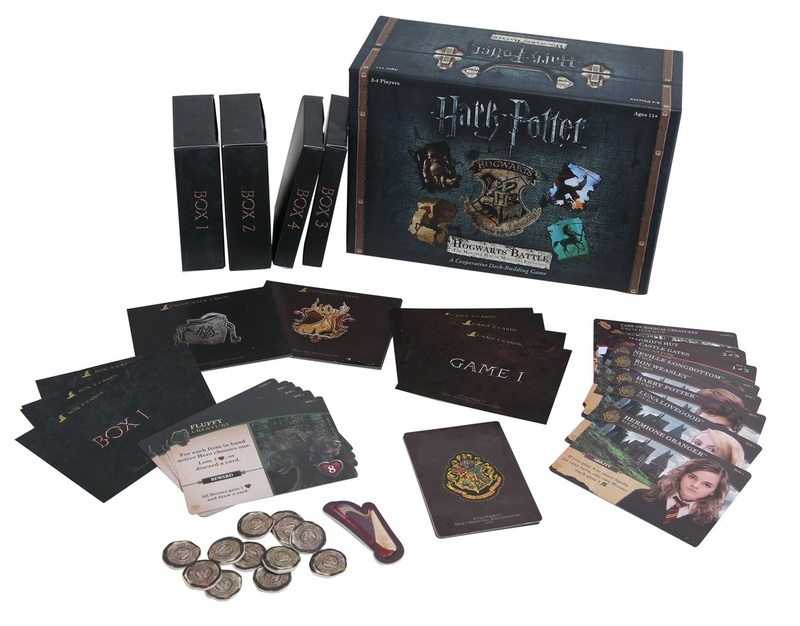 Harry Potter: Hogwarts Battle – The Monster Box of Monsters Expansion is an expansion for Harry Potter: Hogwarts Battle that adds 4 boxes worth of new content including a new playable character. The expansion doesn’t really add any additional play time to the game. Most game sessions still last around an hour. Like with the original game, the artwork and theme of the game are fully integrated and look great. The artwork is almost all photo quality images. The few items and pieces that aren’t photo quality still fit well with the theme and don’t distract. The expansion adds quite a good bit of content and ups the difficulty a fairly good bit. Players that struggled through the base game, might have a hard time making it through the different boxes of this one. Those players that felt the main game was too easy, will definitely find the challenge they were looking for in this expansion. Fans of the Harry Potter universe will definitely enjoy being able to play as Luna Lovegood. I still think Ginny Weaseley would have been nice to have as a playable character, but maybe she’ll be available in the next expansion. Here’s hoping that happens. Not everyone will find this a must buy, but for fans of the original game and those looking for a challenge, it will be. I highly recommend this expansion. I am thoroughly enjoying it and look forward to many more games in the wizarding world of Harry Potter. No Nargles were harmed during the writing of this review. This entry was posted in Reviews and tagged battle, board, board games, box, card, card games, games, harry, harry potter, hogwarts, hogwarts battle, monster, monster box of monsters, monsters, potter, usaopoly. Bookmark the permalink. Having said that, though… thanks again for the review, well written and informative!